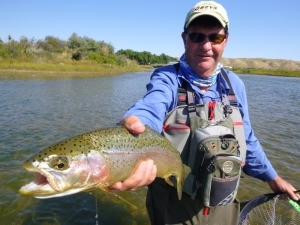 Having an angler that can double-haul as well as cast two leaded messengers of death, Autumn Splendor (sizes 6 & 8) and the ubiquitous, Big Hole Crawler (sizes 8 & 10) can bring the Big Hole to its knees. Weather mid-70’s, no wind and the fishing, great. Like going to heaven without dying.